(UPDATED) The first official list of candidates for the University Student Council (USC) elections was released Friday by the University Student Electoral Board (USEB). 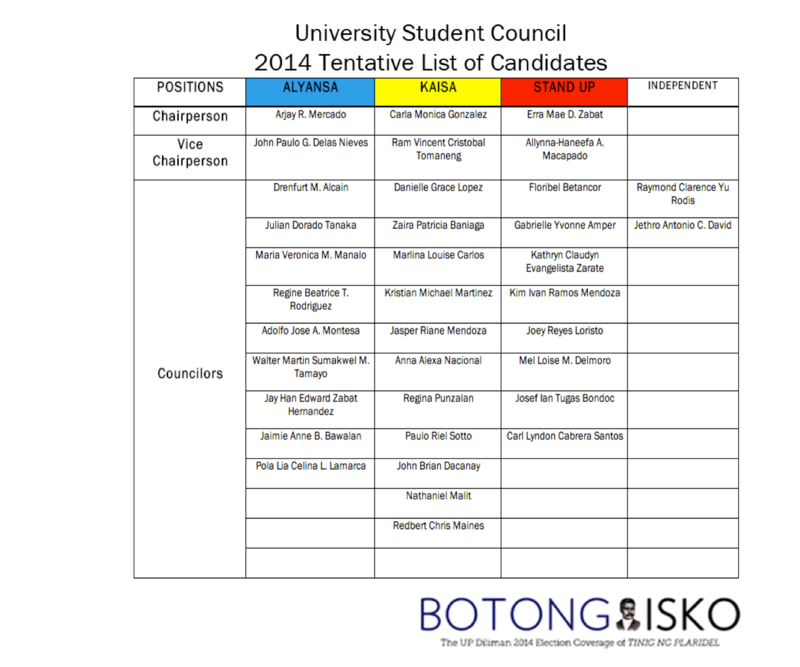 Three incumbent USC councilors will vie for the Chairpersonship of the USC. Nagkakaisang Iskolar para sa Pamantasan at Sambayanan (KAISA), party of incumbent USC Chairperson Alex Castro, will be betting on incumbent USC Councilor Carla Gonzalez as their candidate for Chairperson, with incumbent College of Science Representative to the USC Ram Vincent Tomaneng running as Vice Chairperson. Gonzalez got the highest number of votes for councilor in last year’s elections. KAISA currently has 11 candidates vying for the posts for USC Councilors and six candidates for College Representatives. Incumbent USC Councilors Arjay Mercado and John Paulo Delas Nieves will be running for the position of Chairperson and Vice Chairperson, respectively, under UP Alyansa ng mga Mag-aaral para sa Panlipunang Katwiran at Kaunlaran (ALYANSA). ALYANSA currently has nine candidates in the running for the 12 slots in the USC Councilor position and 10 candidates for College Representative posts. The Student Alliance for the Advancement of Democratic Rights in UP (STAND UP) will be fielding incumbent USC Councilor Erra Zabat as Chairperson with fellow incumbent Councilor Allynna-Haneefa Macapado for Vice Chairperson. Eight candidates for Councilorship will be representing STAND UP along with eleven candidates as College Representatives. Raymond Rodis, incumbent Chairperson of the National College of Public Administration and Governance Student Council and Jethro Antonio David from the College of Science will be running independently as USC Councilors. Six aspiring college representatives to the USC will also be running independently. USEB disapproved the candidacies for the councilor post of Thomas Benjamin Roca from the College of Mass Communication and Miguel Enrico Pangalangan from the College of Arts and Letters. Both are running under STAND UP. KAISA’s Michelle Lao from the College of Law and STAND UP’s Mechani Leila Tilendo from the College of Engineering have both received a pending status as councilor candidates. According to the 2010 Student Guide of UP Diliman, under the Article VII of the Revised UPD Student Election Code, candidates must secure a certification from their respective Deans that they have not been found guilty in any disciplinary case of any act involving moral turpitude as defined in the Revised Penal Code. Candidates must also submit a certification from their respective College Secretaries that they are in good academic standing and are carrying the normal academic load prescribed by their respective units. Certifications must be submitted together with the certificate of candidacy. Pending and disapproved candidates can still appeal to the USEB for reconsideration. The filing of protests on candidates starts Friday, Feb. 7, until Monday, Feb. 10. If there would be any protests, the USEB will hold a meeting to act on those protests on Feb. 11. The final official list of candidates will be released on Wednesday, Feb. 12. The USEB is a five-unit body chaired by Vice Chancellor for Student Affairs Prof. Ma. Corazon Jimenez-Tan. Faculty members are Prof. Fidel Nemenzo and Mr. Rocelyn De Vera. Mikayla Therese Teodoro and Lee Yhenchie Ann Gerez are the student representatives.